The Sony Ericsson Live with Walkman has the latest version of the Android Market, featuring a facelift with a bit of WP7 styling. New sections are available such as Staff Picks, Editor’s Choice and a dedicated Sony Ericsson tab, courtesy of the maker. Upon launch of the Market app you’re greeted with the tiled interface of the Featured window. A swipe to the right takes you to the Categories view. You have Top Paid, Top Free, Top Grossing, Top New Paid, Top New Free, Trending (the ones with growing popularity) and Sony Ericsson. The Sony Ericsson pane is the place to get the company optimized apps. It’s something along the lines of the HTC Likes. What we didn’t quite like about the new Android Market layout is that you’ll be forced to do a lot of scrolling if you want to go to a specific category and there isn’t a listed or tabbed menu for quicker access. Sony Ericsson's own store called PlayNow is also on board. There you can get a lot of free things for your phone - wallpapers, some games and apps or even music tracks. 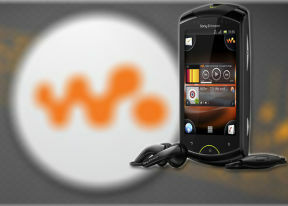 The Live with Walkman will take over from the Sony Ericsson W8. It’s nothing out of the natural order of things. A neat and straightforward upgrade to 5MP autofocus, HD video, a 1GHz processor and a bigger screen. This is an upgrade that makes sense in the context of the Xperia lineup. It makes even more sense in the light of a recent announcement about Sony Ericsson eyeing a complete shift to smartphones. The refreshed Xperia lineup will be a solid foundation to build on. But they need to fill some blanks between the two Arcs and the two minis. That’s where phones like the Live with Walkman and the Xperia Active come in. The way we see it, the Sony Ericsson Live with Walkman is at the bottom of the Xperia food chain. No shame in that: it’s the phone with the youngest demographics and one that seems to know its target audience well. It seems Sony Ericsson know the competition well too. The Live with Walkman has got a welcome boost in processing power, as it’s preparing to tackle Nokia’s recent 1GHz smartphones. We don’t mean any Windows Phone devices – the Walkman droid will surely be out of its depth. It’s the likes of the Nokia 500 and the Nokia 600 that it will try to outsmart. There will be other droids to keep an eye on too and the Wildfire S is among the likeliest contenders. It matches the Live with Walkman in terms of imaging and display, and adds a bit of metal on the body. It’s been around for a while now and doesn’t cost too much. We think the Walkman droid looks the part – not too fancy but young and fresh, affordable without feeling cheap. The same goes for the internals – this is the only one in the new Sony Ericsson lineup without a Bravia screen. The rest of the specs are more than decent though – the phone has plenty of processing power, above average still camera and camcorder and a solid set of apps. The Walkman branding does seem a bit of a gimmick to be honest. The phone’s Walkman player has nothing more to offer than the regular music player in other Xperia smartphones. They didn’t even bother include a custom equalizer. The xLOUD audio setting and Track ID are available across the company’s portfolio. At least, the Walkman button and light effects are something to show. Anyway, the Walkman branding has little to do with the actual performance. It’s a status symbol though – something for the audience to identify with. Plus, the Live with Walkman can take comfort in the fact that it doesn’t do things worse than an Xperia Arc. This can be bad, can it? And we don’t only mean the music player – most of the features are there and the solid social network integration is of particular relevance.